BLOG is a application devoted to the automatic classification of animal species through the analysis of a small portion of mitochondrial DNA, DNA Barcode. The application is described in detail in Bertolazzi, Felici, Weitschek Learning to classify species with barcodes. To run BLOG, you must provide a training set of barcodes (650 sites with A, C, G, T) and the species to which each barcode belongs. Then, logic formulas are extracted from the training data and a test set of one of more barcode is classified according to these formulas. The input files are standard FASTA barcode sequences, described here. Otherwise BLOG can accept a single FASTA file; It will create a train file of almost the 80% of the FASTA sequences, and a train file with the remaining sequences. You can find diverse offline versions of BLOG here. 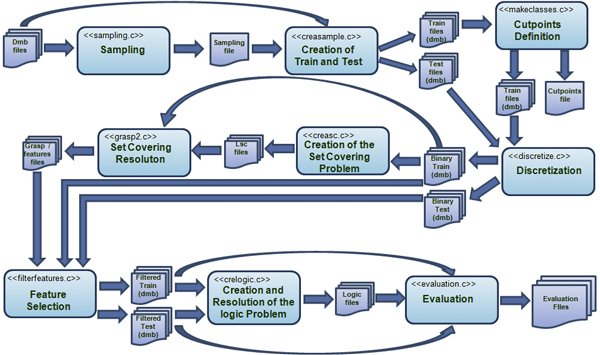 The flow diagram of BLOG in shows a schematic view of the architecture by representing the system flows and the fundamental modules.